The next upcoming Read Across America Day is on Friday March 1st, 2019. Read Across America Day is held annually on a school day closest to March 2nd each year. The day promotes reading for children. Schools and libraries take a lead role in making Read Across America Day happen across the United States. Kids are encouraged to read and set reading goals. The day may include reading fairs and other activities that make reading fun for young people. 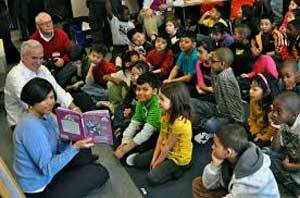 The National Education Association in 1997 moved to create a day to celebrate reading in the United States. The following year in 1998 the day became an official observance in the United States encouraging reading among our youth. March 2nd was selected as the date for this observance because it is the birth date of Dr Seuss who wrote many famous kids books. Read Across America Day is not an national holiday but rather an observance.